A new radiology office is planned for a vacant portion of the South Claiborne Avenue property occupied by the Church of the Annunciation, and it has received initial approval from the City Planning Commission. 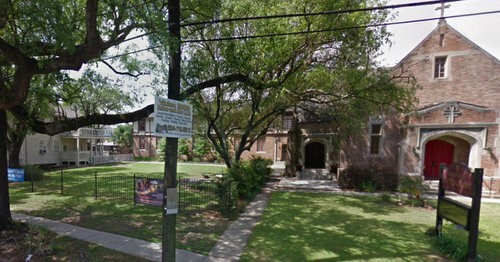 In order to allow a medical office, the Church of the Annunciation needs to change the zoning at 4505-4535 South Claiborne and 3000-3010 Jena from two-family residential to medium-intensity mixed-use. The parcel at 4519 South Claiborne — now used as a parking lot adjacent to the existing brick church and two-story house currently used as an office — has already been sold to a doctor who plans to build a new office there, consultant Rick Eisenstadt of Sherman Strategies said in a hearing on the zoning change last week before the City Planning Commission. “Our client here is a local radiologist, Dr. Jonathan Amite, who envisions putting an imaging center on this location, which we think is very consistent with the unofficial medical corridor that it sits next to,” Eisenstadt said. No one spoke against the project before the City Planning Commission, though some neighbors did write to the commission with concerns. Ann Sens and Glen Steeb, both of whom live on nearby Cadiz Street, had attended an earlier meeting with developers, and each wrote to the commission saying they would prefer to see the rezoning only apply to the actual area where the medical office will be. City planners noted that the recent revisions to the master plan had already changed the site’s future land-use designation from low-density residential to medium-density mixed use, which the medical office fulfills. The commission voted unanimously in favor of the project, sending it to the full City Council for final decision with a recommendation of approval.